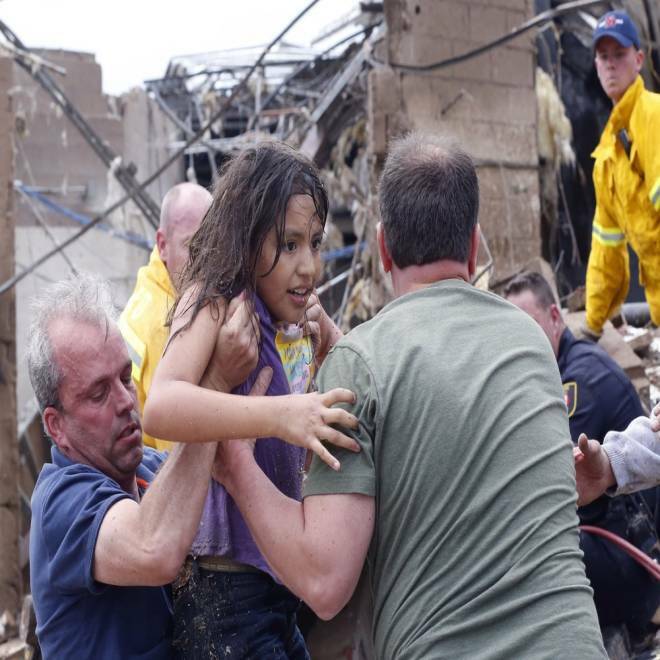 A child is pulled from the rubble of the Plaza Towers Elementary School in Moore, Okla., and passed along to rescuers on May 20. Rhonda Crosswhite, a sixth-grade math at Plaza Towers Elementary School in Moore, Okla., said the idea that school might be canceled Monday because of a looming tornado had never even crossed her mind. The massive tornado that tore through Moore and killed 24 people bore down hard on Plaza Towers, where children sheltered inside from the roaring gusts, even as the building began to come apart around them. The seven students who were killed at Plaza Towers, a single-story cinder block building that was leveled in the storm, were found dead in a pool of water, authorities said. Another student died at Briarwood Elementary, less than two miles away. 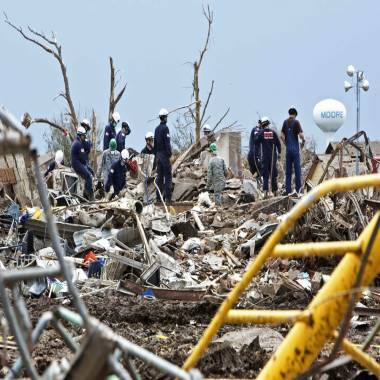 Rescue workers look through the rubble at Plaza Towers Elementary School in Moore, Okla., on May 21, after a devastating tornado ripped through the town on May 20. Tracy Stephan told NBC News that she went to Plaza Towers to pick up her daughter, who suffers from autism and epilepsy, before the tornado hit. She found the doors locked, with the tornado bearing down on her. “Eventually after five minutes after not getting through, I turned back home and I decided to put my faith and trust in God the school was going to be OK,” the mother of three told NBC News. She ran back to the school after the twister passed, and found her daughter outside in the parking lot with other kindergartners. “I grabbed her and wrapped her in my arms,” said Stephan. Levi Hendricks also sped toward the school as the tornado took aim, to pick up his eleven-year-old granddaughter Kimberly. The fourth-grader meanwhile was crouched with some of her classmates in a bathroom and then a hallway. After the tornado passed through, they found a way out of the demolished school. Hendrick’s house, the back door of which once faced Plaza Towers’ busy playground, was flattened by the tornado. Thirty-year-old working mother Janna Ketchie recounts the frantic journey into the heart of a tornado's destruction in order to find her three children, who were miles away at a daycare center. NBC News' Ann Curry reports. In the aftermath of the storm, the First Baptist Church of Moore, about three and half miles from Plaza Towers, became a gathering place for students from all of the city’s schools who had not found their guardians, church spokesman Joey Dean said. “We got word from the schools that they were going to bus all the kids who had not been picked up by their parents yet,” Dean said. Teachers and counselors shuttled over the students in their personal cars. “Most them went home, and those who didn’t have homes, they spent the night,” Dean said. Children in the city’s schools regularly prepare for the possibility of a tornado, district employees said. “We have tornado and fire drills periodically throughout the year,” said Noah Minton, a psychologist for the Moore Public School district. “They have drills, they have proposals they follow, but something this large, you get out of the way,” Minton said. U.S. Representative Tom Cole, a resident of Moore, said on MSNBC that Plaza Towers was one of the most structurally sound buildings in the area. City disaster plans and school documents show that officials had thought through what to do in the event of a tornado. They also suggest, however, that officials did not anticipate a disaster of this scale. If a tornado came during the school day, teachers were instructed to have the students remain in their classrooms unless told to take them elsewhere, according to a cached version of the district’s 2012-2013 handbook for elementary school students and parents. The city of Moore does not have any community tornado shelters, according to the city’s department of emergency management website. The guidelines posted online also refer to the May 3, 1999 tornado outbreak that killed 36 others and injured 295 more. Hendricks said he thinks the instructions to shelter at Plaza Towers might have saved his granddaughter’s life. “I do know there was a lot of lost lives, but I think there would have been a lot more if they let them out,” Hendricks said.